Delegates representing LGBTQ youth and student organisations from the pan European region met in Copenhagen for the General Assembly of the International Lesbian, Gay, Bisexual, Transgender, Queer Youth and Student Organisation (IGLYO). 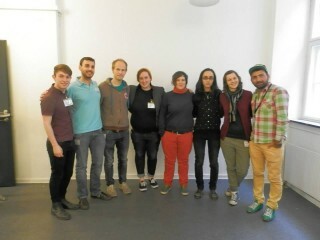 The IGLYO General Assembly was hosted by LGBT Ungdom and Sabaah. 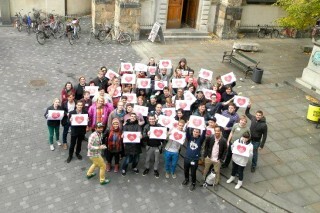 IGLYO is the network of LGBTQ youth and student organisations in Europe and beyond. It is run for young people and by young people and gathers more than 80 member organisations from 40 countries. The General Assembly is the highest decision making body of IGLYO. During the General Assembly, delegates voted on and approved IGLYOs strategic plan for 2014-2018. From 2014 to 2018, IGLYO will focus on education, social inclusion and intersectionality. IGLYO is an inclusive platform and aims to ensure work that reﬂects gender, ethnic and cultural diversity. The General Assembly elected four new board members for a two year mandate which will begin in January 2014: George-Konstantinos Charonis (Greece), Eirik Rise (Norway), Ashot Gevorgyan (Armenia) and Ani Giorgadze (Georgia). They will be joined by current board members who are continuing their two year mandate: Orlaith Hendon (UK/Ireland/Northern Ireland), Helena Kovac (Serbia), Patrick Dempsey (Ireland) and Sarah Rowlinson (Scotland). This year has been a very productive one for IGLYO. IGLYO focused on LGBTQ-phobic bullying in schools, and this work included holding an anti-bullying conference in Norway, developing minimum standards on tackling bullying, as well as conducting research on the effects of LGBTQ-phobic bullying and accessing employment/training. Our minimum standards and research will be launched early 2014. IGLYO has been active on human rights around Europe for LGBTQ Youth. IGLYO is concerned about the situation facing LGBTQ Youth in Russia. IGLYO began a campaign to encourage member organisations to speak out against discrimination and regressive legislative efforts facing LGBTQ Youth in Russia. IGLYO held a study session in Strasbourg on the Council of Europe Recommendations of the Committee of Ministers on LGBT rights. IGLYO also focused on social inclusion and engaged with the EU Presidency and the Structured Dialogue Process. IGLYO participated in an EU Presidency conference on Education, and helped organise an EU Presidency conference on LGBT youth and social inclusion held in Dublin in June. IGLYO would like to thank Roh Petas, Despina (Alex) Michaelidou and Artiom Zavadovski for their service and dedication to IGLYO as executive board members for two years. Virginia Prasmickaite will leave IGLYO as Office Manager. Virga has been an invaluable resource to IGLYO over the past 5 years and has helped IGLYO develop and grow. We want to thank Virga for her hard work and wish her well in her studies. Euan Platt will take the role of Executive Coordinator starting in November. We’re sure he will do a great job and we all look forward to working with him. Thank you to LGBT Ungdom and Sabaah for a fantastic General Assembly. General Assembly 2014 will be held in Dublin, Ireland with BeLonG To Youth Services as host. For more in-depth information on the work IGLYO has done this year, click here.